In nearly 250 years of operation, Starfleet has changed its uniform code a great many times. In some eras, the look was utilitarian, and supported operations in the harsh expanse of space. This is seen in Enterprise’s NASA-inspired jump suits, and the fleet’s current outfit, introduced in First Contact. Other times, elegance and refinement was the preferred approach. 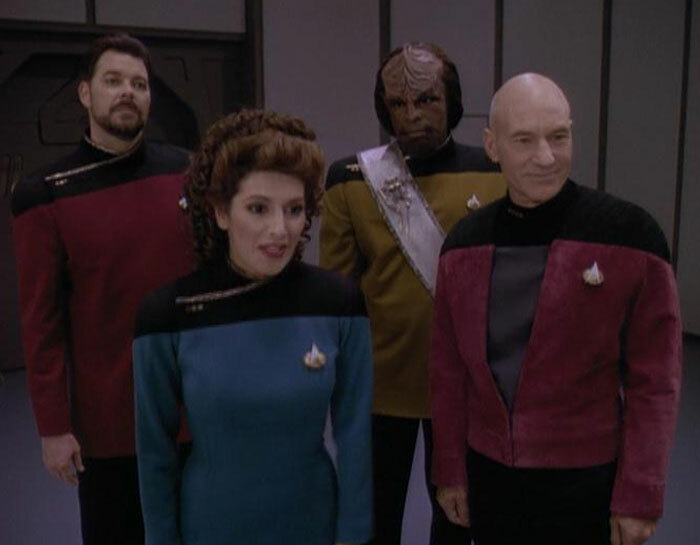 Such examples include the mandarin collars of The Next Generation‘s season three, and the dignified (though sweltering) double-breasted, blood-red jackets and black pants, seen in five of the six original Star Trek movies. And who could forget the look that started it all: the red, gold, and blue tunics and black pant ensemble from The Original Series? In that time period, each starship and instillation had its own distinctive uniform assignment patch – a reminder of the long-past days when the Starfleet chevron we know today did not apply universally. It seems that everyone has a favorite uniform from the franchise. Each carries such a legacy, and all of them have something to offer the discerning tailor in all of us – well, almost (I’m looking at you, Motion Picture one-piece pajamas!). This week’s poll asks you to name your preferred uniform, and why you prefer it. Are you looking for dignity, or classic style, or functionality? Or something else? Leave your answers there, and explain them in the comments section!